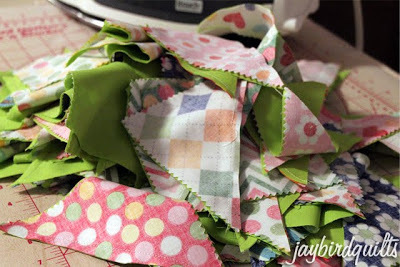 When I first started quilting almost everything I made had three fabrics in it. A loud busy print and two solids or tone on tones to match. For almost a year I went alone with my 1 + 2 = an entire quilt plan. This is what happens when you are self taught and have no quilters in your life to guide you! Nevertheless one day I woke up and discovered I had choices. It was information overload and my quilts for quite some time were all over the place in style. As time went on I found myself using less and less solids. Someone along the way had misguided me and told me that solids didn't have life to them. This came during my "learn from real quilters" phase that turned out to be "all quilters have their own rules" phase. In time I developed my own voice and a renewed love for solids. 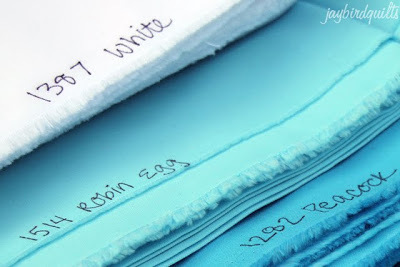 Today I'm going to share with you a few works in progress that I have going on with solids, tips for how I keep track of mine, and a lot of yummy photos of fabric. My personal style right now has led me to a place of mixing prints with solids. I love the high contrast that can occur when mixing the right solid with a print. Initially I was using mostly white, black & grey. Recently I've been on a green kick as well as experimenting with using many different solids in the same project. i have a lot of trimming to do! i also have a work in progress with tufted tweets & an assortment of colors of kona solids. Back in july when i had the opportunity to spend some time at RK i took a ton of photos! 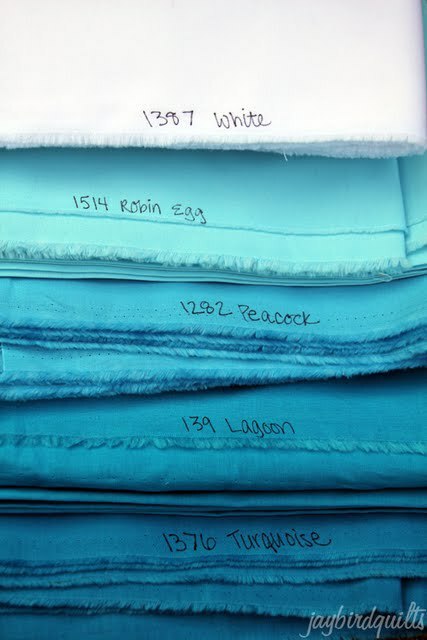 did you know that RK has charm packs in an assortment of combinations of solids? and a color card is a must have for any solids fan! but i couldn't figure out how to get it in my purse without anyone seeing. oh well. 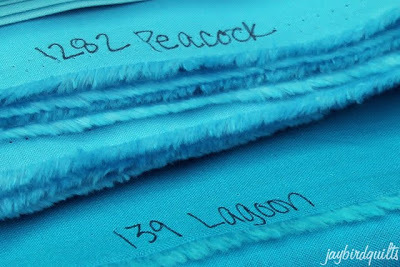 One major noticeable difference that solids have from prints is a lack of a printed selvage with information. This is because solids are dyed and not printed. Even with a color card i was often forgetting which color was which and mixing them up. Then one day i had an aha moment! sometimes i want to use lagoon... and sometimes i want to use peacock.. and very often i can't remember which is which! Do you have tips for keeping track of solids? Any works in progress with solids you want to share?